MINNEAPOLIS, MN (KTRK) -- The Minnesota Vikings remain undefeated after a decisive victory over the Houston Texans 31-13 at U.S. Bank Stadium in Minneapolis. The Vikings (5-0) seemingly controlled the game from the first quarter, taking a quick 14-0 lead. 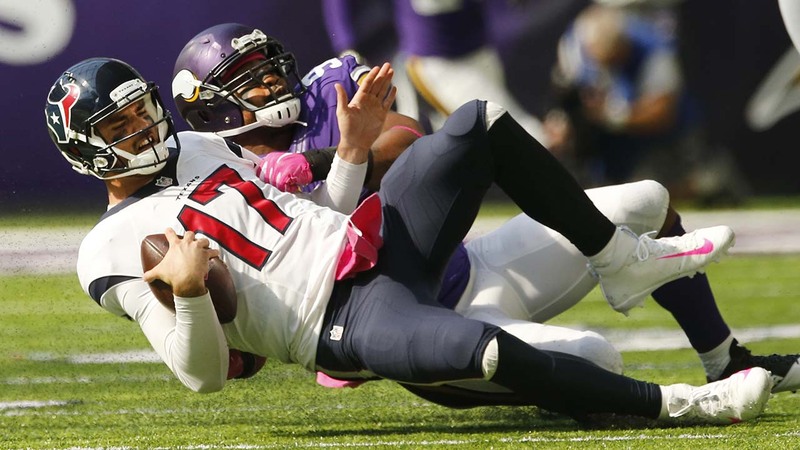 At the half, the Texans (3-2) mustered only 48 yards passing against the Vikings defense. Minnesota's Sam Bradford, playing for the injured Teddy Bridgewater, lead all players with 271 yards passing and two touchdown passes. Those yards were against arguably the best secondary in the NFL -- the Texans defense. Brock Osweiler was overmatched by Minnesota's relentless rush and coverage, finishing 19 for 42 for 184 yards, one interception and a late touchdown pass while taking four sacks. The Texans (3-2) were denied on 12 of 13 third downs, unable or unwilling to do much other than dump off short passes. Lamar Miller only had eight carries for 20 yards during a dud of a performance by the Texans that felt a lot like the 27-0 loss at New England two weeks ago. Rookie Will Fuller wasn't targeted until the first play of the second half and had only one catch, a head-scratching fourth-and-16 call in the third quarter at the Vikings 39 that netted 4 yards on a screen play. After the game, Head Coach Bill O'Brien told reporters that the loss "starts and ends with me." "When you play that bad, it's a reflection of the coach," O'Brien said. Osweiler says he has to play better. "We need to score more points," Osweiler said. "It starts with me." The Vikings managed 351 total yards compared to the Texans 214. In terms of time of possession, the Texans were only able to keep the ball nearly 22 minutes of the game compared to Minnesota's 37 minutes. The Texans will face the Indianapolis Colts (2-3) next week at NRG Stadium for Sunday Night Football.